Les Misérables restores our faith in revamped productions of much-beloved classic musicals. Ramin Karimloo will make you weep, or at least want to give him a hug, as Jean Valjean in Les Miserables. Photo by Matthew Murphy. Every revolution needs a leader. And though the movement to bring the classic 1980s musical Les Misérables back to Toronto is markedly different than the quest for political accountability and social equality, it has its hero just the same. 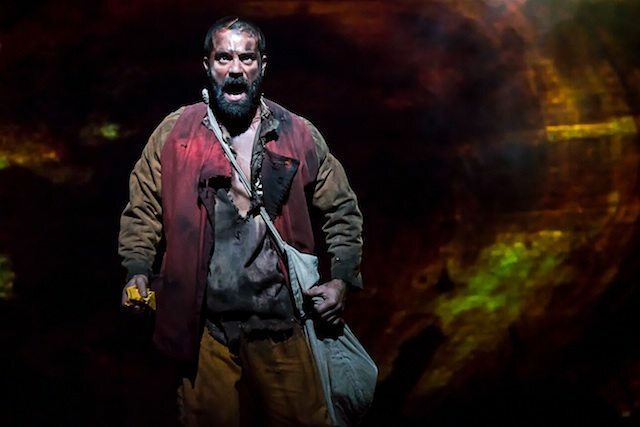 After the official opening performance at the Princess of Wales Theatre, the audience likely would have followed London-based, Richmond Hill-raised performer Ramin Karimloo (as the story’s golden-hearted protagonist, Jean Valjean) anywhere he would lead. Valjean—as anyone familiar with either Victor Hugo’s novel, the musical, or last year’s Oscar-winning movie already knows—is imprisoned for 19 years for stealing a loaf of bread to feed his starving nephew. While in custody, he’s whipped and forced to row a big boat. But, for prisoner 24601, life outside of prison is almost just as difficult, and it isn’t until he’s forced to steal from a kind bishop that he resolves to be a better man, setting off the events of the play. All this happens in the short prologue (Les Mis might be melodramatic and almost three hours long, but it does cover a lot of ground), but that’s enough time for Karimloo to show his stuff. He’s dirty and scarred and angry and confused, and you can practically feel the heat of his hatred for the world radiating from the stage. During the song “What Have I Done?” his face contorts as he rips the yellow piece of paper documenting his crime, while his voice ascends in a desperate cry for a new life. We don’t see him so physically fiery again, because Valjean chooses a saintly noble life. But Karimloo excels again at the entirely opposite end of the spectrum, in the slow and passionate “Bring Him Home,” a clear crowd favourite. But if Karimloo had a second-in-command, we suppose that would be producer Cameron Mackinstosh, who’s responsible for the new production (with Mirvish Productions) of Les Misérables and its transfer to Broadway after this 18-week Toronto run is over. He’s also in the process of “revamping” Miss Saigon and Phantom of the Opera “for a new generation.” “Revamping” can be a nerve-wracking word, because recently it has meant slapping cheap and distracting projections on top of mediocre sets (a la Mirvish’s Wizard of Oz, or the Stratford Festival’s Tommy). In this Les Misérables, projections are used mostly to display Hugo’s paintings of Paris landscapes. They only occasionally slide into cheesy special effects. For example, Valjean and Marius traveling through the Paris sewers becomes a movie-like montage that tries a little too hard to dazzle the audience. On the other hand, the staging for “Empty Chairs and Empty Tables” is stripped down to Marius and his ghostly brothers holding a dozen small candles, which is a very different brand of cheese. But save for occasional disappointing moments, this is a rather smart, restrained “revamping” of an epic, sprawling musical that places the cast front and centre. Impressively, even the battle scene doesn’t overpower the performers. With a leader like Karimloo, the musical-theatre revolution has a bright future. CORRECTION: October 11, 2013, 2:55 PM Jean Valjean was imprisoned for 19 years, not 20, as this post originally said. UPDATE: November 4, 2013, 5:20 PM The production’s run has now been extended until February 2, 2014.